From left: Jonna Kuskey with Arch Coal spokesperson Randy Cheetham. 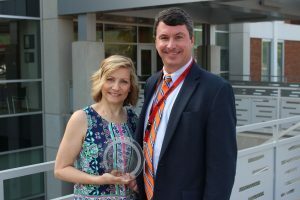 John Marshall High School English teacher Jonna Kuskey was presented a 2018 Arch Coal Teacher Achievement Award Tuesday morning by Arch Coal spokesperson Randy Cheetham. Former student Brandi Powell, West Liberty University Professor of English Dr. Steve Criniti and JM Assistant Principal Katie Dantrassy nominated her for the award because of the impact she has made on her students and coworkers. Kuskey has been teaching high school for 12 years, serving all 12 as a Monarch. She taught for several years at Belmont Technical College as an adjunct professor in Psychology and Sociology. JM Head Principal Cassie Porter, Marshall County Schools Assistant Superintendent Corey Murphy and Kuskey’s colleagues gathered to surprise her with the presentation of the award. Along with a plaque, Cheetham gave Kuskey a check for $3,500 to put toward classroom supplies. Kuskey joins nine other West Virginia teachers in receiving this honor. Previous Arch Coal Teacher Achievement Award winners from around the state look at each application and pick who they believe are outstanding teachers. The prestigious Arch Coal program is the longest-running, privately sponsored teacher awards program in West Virginia.